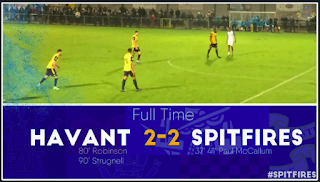 Paul McCallum scored twice for the Spitfires in the Boxing Day derby but rivals Havant & Waterlooville fought back from 2-0 down to salvage a point. Michael Green was sent off for the Spitfires late on. 🗣 "It's two points dropped"
Cav Miley came off the bench to score the winning goal as Eastleigh secured all three points at home against Harrogate with a 2-1 win. 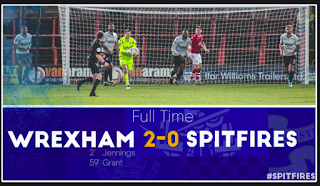 Eastleigh's seven game unbeaten run in the league came to an end with a 2-0 defeat away at Wrexham. 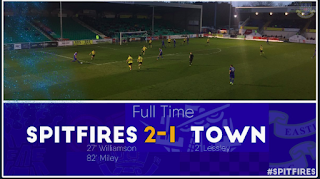 Eastleigh raced into an early lead through Ben Williamson with less than 2 minutes played before the visitors hit back with two goals to go in front. Paul McCallum equalised late in the game to salvage a point for the Spitfires on former Eastleigh boss Andy Hessenthaler's return to the Silverlake Stadium.